The BREAZE Board invites you to attend the 2016 AGM. The Board is keen to get members of our community involved in our activities. If you have any ideas you would like to implement, prepared to volunteer for one off or ongoing activities, be part of the board, involved in a related environmental group or just want to see what goes on we would be pleased to see you. If you have any questions regarding the AGM, nomination or proxy forms please call 0432 635 637. The official business of the AGM is to elect our board members and office bearers. However, we would like to invite interested parties to join us for light refreshments after the AGM for a general informal discussion. 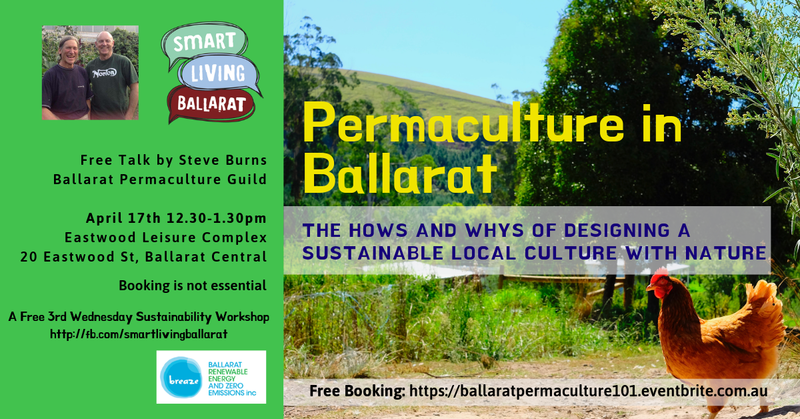 It’s been an action packed few months for BREAZE members with Sustainable House Day, the renewal of BREAZE’s permit to conduct the Ballarat Farmers Market for the next 2 years and the unveiling of BREAZE’s first community renewable energy project at BRI last Thursday. While these events have consumed much time and effort by our Board and volunteers, we have also been busy in our advocacy roles making a submission to the Victorian Parliamentary Enquiry into Community Renewable Energy Projects and responses in the media to the recent criticism of the progressive state’s renewable energy targets. We are currently automating membership and copying information from our old systems. These facilities will be available shortly. After nearly ten years the time has come for another website revamp. In this time, the sustainable landscape has changed, as there is more information on the web, many more sustainable groups operating in our region. The BREAZE Board has sold down its shareholding in BREAZE Energy Solutions to 20%. Since its inception BREAZE has been involved in the sale of renewable energy solutions. Together with the changes in regulation, acceptance and normalisation of solar hot water and electricity in the community, and the administration costs involved, your Board undertook a very thorough review of the need to be the sole shareholder in BREAZE Enterprises Pty Ltd, trading as BREAZE Energy Solutions, earlier this year. The outcome of this review was that it would be in the best interest of both organisations for BREAZE Inc. to reduced its shareholding to 20%. BREAZE acknowledges the valuable contribution made by Melanie Stanger, The Changesmiths, for the BREAZE branding, posters and graphics since we began in 2006. BREAZE partners with groups and organisations within the Ballarat area that have a natural affilliation due to their goals and values. Probono services are also provided by local organisations, and we thank them for their expertise. We encourage members to support the companies supporting our Sustainability and Environment. If you are with one of the big four banks, and you consider yourself environmentally responsible, you should consider switching now. If you switch your home loan, or take out a new home loan through the Affinity Program, BREAZE will receive 0.4% from Bank Australia. It won’t affect your interest rate, fees or loan structure in any way. At least 50% of this will be used in the BREAZE’s Social Solar by BREAZE. 1 mecu Limited ABN 21 087 651 607 AFSL/Australian Credit Licence Number 238431 trading as Bank Australia. Loans subject to normal lending criteria and approval. Rates apply to applications received from 04/04/2016 however are subject to change at anytime. Check bankaust.com.au for the latest rates. Offer available to new and existing borrowers. Excludes investment loans. For existing borrowers the new loan funds must exceed $100,000. Borrowers must transfer their full salary credit to a Bank Australia account to be eligible for the basic home loan – salary credit rate of 3.98%. For self employed borrowers, in lieu of a salary credit a minimum $2,000 per month deposit to a Bank Australia account is required. If a full salary credit is not established the rate will be 4.10%. 2 The Comparison Rate is based on a loan of $150,000 for 25 years. Fees and charges may be applicable. 3 Redraw. A $25 redraw fee is payable for each redraw transaction. Minimum redraw of $500 applies. Redraw not available during an interest only or fixed period. 4 Repayment Pause. Loans must be established for a full 12 months and a maximum Loan to Value Ratio of 90% (Family-Pause) or 90% (Eco-Pause) applies. Pausing repayments will result in interest continuing to accrue on the loan, potentially increasing the term of your loan. Full conditions available from Bank Australia. Potlucks for 2019 - will be run on an ad-hoc basis.